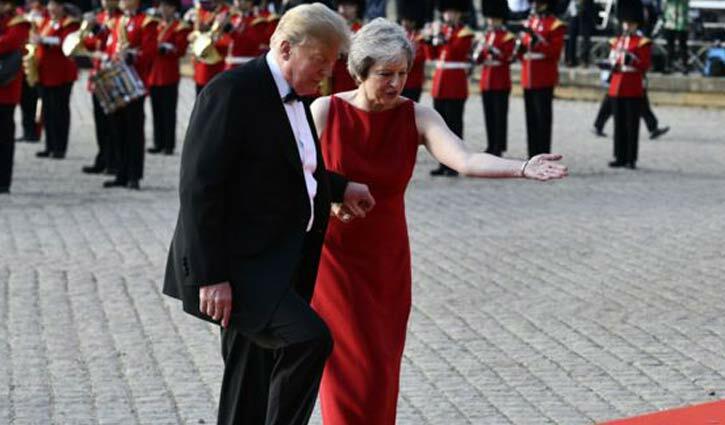 U.S. President Donald Trump lobbed a verbal hand grenade into Theresa May's carefully constructed plans for Brexit, saying Thursday that the British leader had wrecked the country's exit from the European Union and likely "killed" chances of a free-trade deal with the United States. Trump, who is making his first presidential visit to Britain, told The Sun newspaper he had advised May on how to conduct Brexit negotiations, "but she didn't listen to me." "She should negotiate the best way she knows how. But it is too bad what is going on," the president said. The Rupert Murdoch-owned tabloid published an interview with Trump as May was hosting him at a black-tie dinner at Blenheim Palace, birthplace of Britain's World War II Prime Minister Winston Churchill — the leader who coined the term "special relationship" for the trans-Atlantic bond. The Sun said the interview was conducted Thursday in Brussels, before Trump traveled to Britain. His remarks on Brexit came the same day May's government published long-awaited proposals for Britain's relations with the EU after it leaves the bloc next year. The plan has infuriated fervent Brexit supporters, who think sticking close to the bloc would limit Britain's ability to strike new trade deals around the world. Foreign Secretary Boris Johnson and Brexit Secretary David Davis both quit the government this week in protest. Trump came down firmly on the side of the Brexiteers. He said Johnson, May's now ex-foreign secretary, "would be a great prime minister. I think he's got what it takes." "If they do a deal like that, we would be dealing with the European Union instead of dealing with the U.K., so it will probably kill the deal," Trump said. He said "the deal she is striking is a much different deal than the one the people voted on." In fact, much of Britain's division over Brexit — which has split the governing Conservative party and the public at large — stems from the June 2016 referendum on withdrawing from the EU not including language about would come next. May's government is trying to satisfy Britons who voted for their country to leave the bloc, but to set an independent course without hobbling businesses, security agencies and other sectors that are closely entwined with the EU. "They voted for us to take back control of our money, our law and our borders," she said. "That is exactly what we will do." Trump's undiplomatic attack on May, his host, will likely raise the temperature around an already controversial visit. Thousands of people are expected to protest against the president in London on Friday, when a 20-foot (6-meter) balloon depicting the president as a screaming baby will be flown near Parliament. Trump's interview easily could overshadow the government's attempt to lay out plans for what it calls a "principled and pragmatic" Brexit. Britain is currently part of the EU's single market — which allows for the frictionless flow of goods and services among the 28 member states — and its tariff-free customs union for goods. That will end after the U.K. leaves the bloc in March. The plans laid out Thursday in a 98-page government paper gave Britain's most detailed answer yet to the question of what will replace them. Under the blueprint, Britain would stick to a "common rulebook" with the EU for goods and agricultural products in return for free trade, without tariffs or border customs checks. Such an approach would avoid disruption to automakers and other manufacturers that source parts from multiple countries. The government said Britain would act "as if in a combined customs territory" with the EU, using technology at its border to determine whether goods from third countries were bound for Britain or the EU, and charging the appropriate tariffs in those cases. Free trade would not apply to services, which account for 80 percent of the British economy. The government said that would give Britain "freedom to chart our own path," though it would mean less access to EU markets than there is now. When the U.K. leaves the EU, it will end the automatic right of EU citizens to live and work in Britain. But Britain said EU nationals should be able to travel visa-free to Britain for tourism or "temporary business," and there should be measures allowing young people and students to work and study in Britain. Other elements likely to anger Brexit-backers are Britain's willingness to pay the EU for access to certain agencies and the suggestion some EU citizens could continue to work in Britain visa-free. Pro-Brexit Conservative lawmaker Jacob Rees-Mogg colorfully described the plan as "the greatest vassalage since King John paid homage to Phillip II at Le Goulet in 1200."